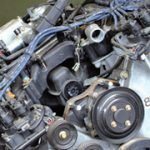 Before you embark on the rebuild and start scouring local scrap yards and online websites, it will be helpful to understand what to look for and what to avoid in these axles. 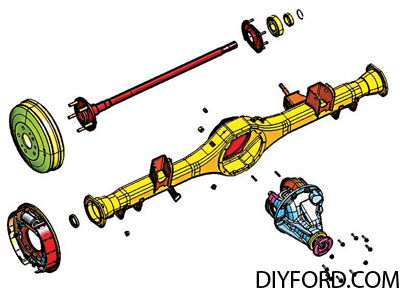 First, you need to understand some fundamentals of the Ford axles to help guide your quest. I have spent countless hours over the years collecting, reading, and studying old shop manuals, supplier reference documents, SAE papers, and even vehicle manufacturer reports and notes. 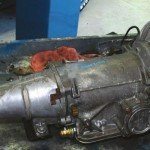 Some of this information is very important as it is becoming more and more difficult to find documentation on axles and differentials that were built more than 40 years ago. I have also spent many hours in scrap yards and visiting and interviewing the experts in this field along with years of building numerous axles myself. 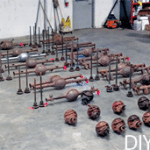 In this chapter I share a summary of decades of work on these axles. As part of my research, I went to renowned Currie Enterprises and gathered one of just about every different 9-inch axle variant. I put together a whole collection of housings and third members. This is a sampling of some of them. Here is a quick visual summary: The 1957 housings do not have dimples on them and have an oil drain plug. 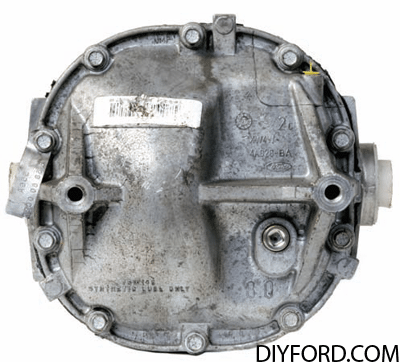 The 1958s and 1959s have two dimples on either side of the housing and some have drain plugs. The 1960s to 1967s still retain the dimples but also have an oil level plug in the back cover. The Ford 8.8-inch axle has a cast center section and the internal components are installed from the rear. 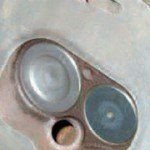 There is typically a stamped steel cover that must be removed to gain access to the internals. This chart serves as a general guideline for axle fl ange-to-fl ange width based on different models and production years. I have included the narrow 8-inch axles for reference. The narrowest production 9-inch axle is 56.375 inches. If measuring the drum-to-drum distance, add .200-inch to these values. 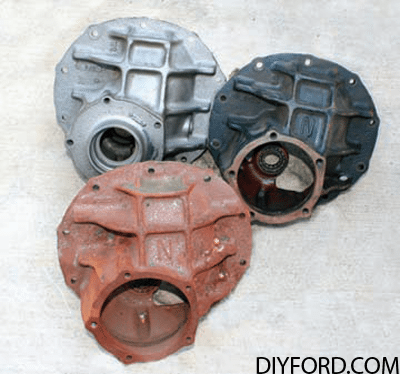 An assortment of Ford 9-inch axle stampings is welded together to create the housing. The cast-iron third member is installed from the front of the housing. The third member supports all of the gears and bearings, which allows for easier gear ratio swaps if you have multiple third members. 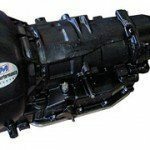 There is a very fundamental difference between Ford’s 8.8- and 9-inch axles. I reference these axles based on the ring gear nominal outside diameter in inches. The fundamental difference between these axles is how the gears are supported and which end of the axle housing (front or back) that they are assembled from. It may seem strange to begin by comparing the 8-inch to the 9-inch axle, but there is an important distinction to make since the 8-inch axle is weaker than the 9-inch. 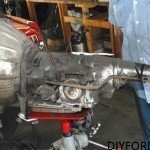 Many people are not aware that Ford made a smaller banjo axle and confuse the 8-inch for a 9-inch. 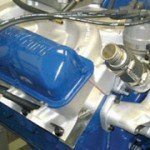 The 8-inch was introduced in 1962 and is found in many lower performance Fairlanes, Mustangs, Falcons, Comets, Cougars, and Pintos, just to name a few of the applications. There’s an easy way to tell an 8-inch apart from a 9-inch. All of the 8-inch case nuts can be accessed with a socket. In contrast, on the 9-inch, two nuts on the bottom at about the 6 and 7 o’clock positions cannot be accessed with a socket and require a wrench. Both axles share a common design and are often referred to as banjo style or third-member style. The smaller 8-inch just cannot handle the abuse as its bigger brother can. The 8-inch also was only available with 28-tooth axle shafts. 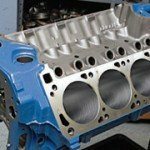 Unless you are building a Pinto or straight six-cylinder vehicle, you want to avoid it. The smaller 8-inch third member is on the right. Note the two lower bolts at 6 and 7 o’clock have straight access with a socket. The 9-inch third-member bottom fasteners, on the left, can only be accessed with a wrench. This is an easy way to identify the third members, so you’re sure to buy the correct axle. Both 8- and 9-inch axle housings are made from a series of stampings that are fixtured and welded together. 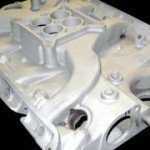 This complex fixturing and welding process, coupled with fuel economy concerns, is what eventually led to their production demise. These axles had a stout 2.25-inch ring gear offset as compared to a 1.5-inch ring gear offset of the later 8.8-inch axle. The larger offset is better for strength and noise but worse for sliding and efficiency. While the larger offset makes the ring and pinion gears stronger, the additional sliding of the gear teeth creates more heat in the axle. Therefore, these axle assemblies require better quality oil and good underbody airflow to keep the unit cool. 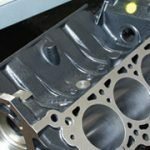 With their high-volume production, the two biggest quality problems were leaks from poor welds and poor alignment of the housings. So don’t be surprised that most of these axles leak from the welds. 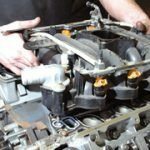 Careful aftermarket shops and their stringent attention to repairing these housings are able to correct many of these issues. The Ford 9-inch has a reputation as a durable axle that can transmit enormous torque, and this is rightfully deserved. Some even consider these axles to be bulletproof. 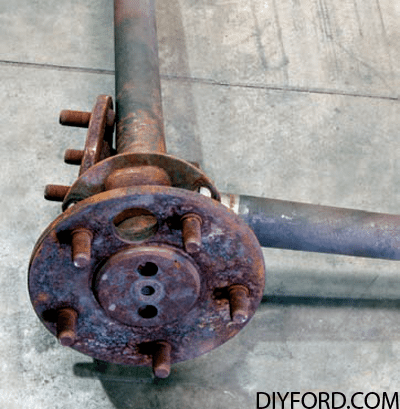 This is by far the most common axle used by restorers, hot rodders, customizers, and racers. It has enjoyed a long production history with many variants. There is a huge aftermarket support for this axle design. Many companies, such as Currie Enterprises, Mark Williams Enterprises, Moser Engineering, and Strange Engineering, reproduce this design today. It is still used in NASCAR racing as well. Because of the long production history of this axle, many variants are available. Most of the time, the differences are in shock and spring mounting brackets and, of course, brake hardware. It is a banjo-style axle as is the 8-inch. 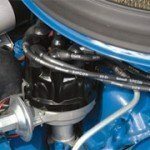 It was in production on many Ford cars and trucks, first appearing in 1957 and finally replaced by the Salisbury-style 8.8-inch axle in 1986, saving about 50 pounds and boasting increased efficiency. Here is an example of a weld repair on a factory original housing. It was required to repair a leaking weld. 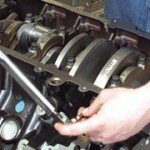 The repair process requires the axle to be disassembled and thoroughly cleaned. 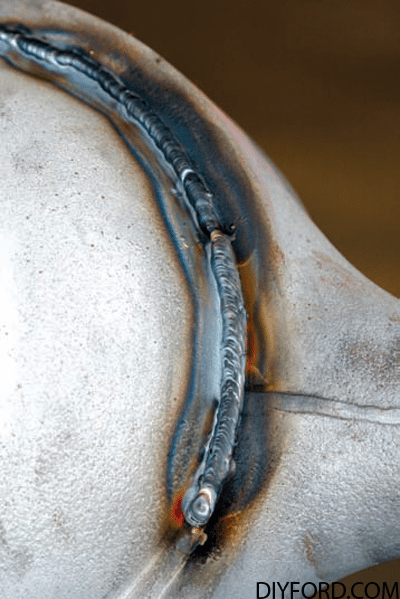 The leaking weld area is then ground down and a MIG or TIG welder is used for the repair. This is a relatively common issue on these housings. The straddle-mounted pinion has a roller bearing in the gear case, which provides additional support for the pinion under heavy loads. This bearing and the casting structure surrounding it need to be carefully inspected as this is a common area for cracks. This pinion has the tapered bearings and collapsible spacer in place. The bearing cups are in the pinion cartridge and the third bearing trunnion roller bearing is located in the gear case. 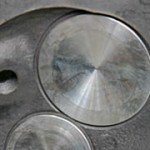 This pinion shows excessive wear on the trunnion surface and should not be re-used. The 9-inch’s very large pinion offset of 2.25 inches requires the pinion to be straddle mounted, which refers to the fact the pinion head has bearings that straddle it on either side. There is a machined roller bearing race on the pinion head portion that points at the differential opposite the tapered bearing races. 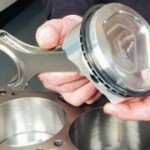 This additional bearing and, more importantly, the necessary casting support structure is what drives the larger hypoid offset. The additional straddle mount pocket bearing provides additional support to the pinion head during high-torque events. This bearing is one of the reasons that the 9-inch has the reputation for being bulletproof. 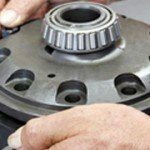 There are three bearings on the pinion shaft: the two traditional tapered roller bearings for the head and tail bearings with a third cylindrical roller bearing on the opposite end of the pinion head. 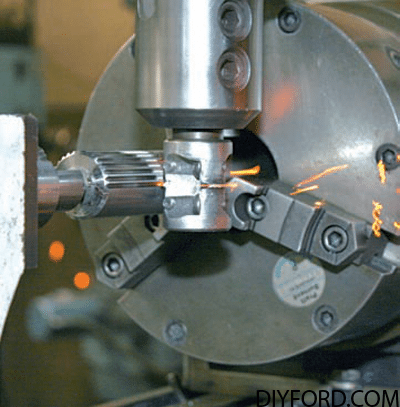 In order to allow for the additional straddle mounted bearing and casting support structure, the hypoid offset needs to be large enough to clear the differential case. 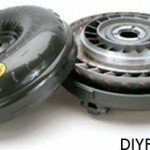 Hypoid offset is the distance between the centerline of the pinion and the centerline of the ring gear. This is 2.25 inches for the Ford 9-inch and 1.5 inches for the 8.8-inch axle. People have been climbing around scrap yards for years to find the best examples of the 9-inch axle. If you are fortunate enough to find an axle with the identification tag still attached, it will help solve part of the mystery of what application the axle came from and what might still be inside. 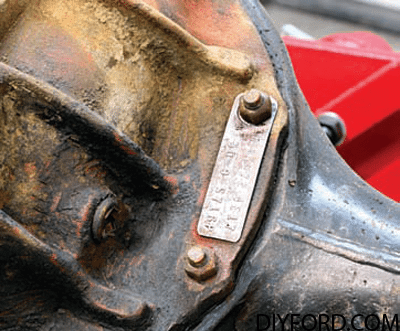 The axle identification tag is located at about the 3 o’clock position under the third-member mounting nut when you are looking straight at the front of the axle. These tags are typically quite beat up, twisted, and rusted over the years. These tags were not that informativeon the early units, so from 1957 to 1962 the tag just referenced axle ratio. In 1963, Ford included more information. This is a typical axle tag that has been removed from the third member. The code, 4L11, tells us that it is a 4.11:1 ratio with a limited-slip or Traction-Lok differential. It also has a 9-inch ring gear. The axle tag typically has two lines of numbers and letters stamped on it. The format has changed over the years but mostly follow this sequence:. 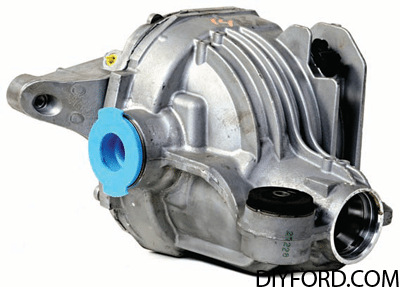 The top line typically starts with a three-digit axle model code (or the prefix of the part number), followed by a dash, and then the suffix. The axle model codes are interchangeable, typically the suffixes are different for a revision change but the axle is still interchangeable with one having the previous suffix. There may be a second dash and more numbers and letters on the top row if there are specifics that are unique for interchange information. 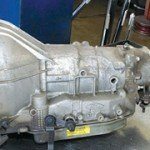 Typically with just this information, you can cross reference what you need to know about the axle. The last set of digits on the top row on the right side is the date code. The bottom line begins with the ratio being the first set of numbers. 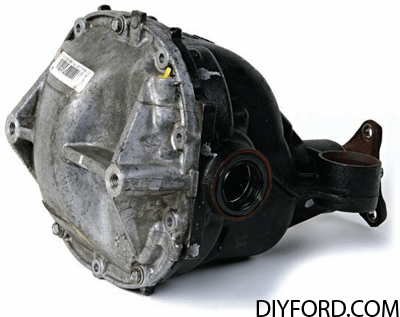 If an L is included, it was equipped with a limited-slip differential or Traction- Lok. The middle number is the ring gear diameter in inches, typically an 8 or 9. The last set of numbers is the vehicle plant code. 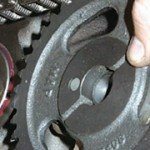 If the axle tag is missing, as most are, you need to remove the third member in order to know what ratio you have and if it has a limited-slip or not. This custom axle tag was obviously hand cut as evidenced by the sharp tin-snipped-looking ends and includes DSO, for Dealer Special Order. Notice that the date code is C9UA with the ring gear size of 8.7. This was an 8.75- inch ring gear in a 9-inch housing. These were used sporadically until about 1969. You can install a true 9-inch gear in these housings as well. Don’t be surprised if the tag you have does not exactly match this. There are also unique domestic special-option tags, which don’t follow the format. The date code is stamped on the tag. The first number is the last digit of the model year of the decade, the next digit is a letter and represents the month (A is for January, B is for February, and so on), and the last two digits represent the day of the month. This format is also applicable to casting date codes. A metal axle tag is typically located on the driver-side front of the third member. It is underneath one of the nuts that holds the third member in place. In most cases, the tag has been lost. On this particular third member, the original copper washers that were under the factory fasteners have been discarded as well. Some tags reference the week of the month instead of the exact day and just use a letter (A to E) for first through the fifth week of the month. You are looking for a nodular iron case, with its telltale “N” cast into the front or inside wall. These third members are the strongest of the production cases and the most desired. Aftermarket vendors are actually re-casting these cases in very strong nodular iron, so more often than not it is easiest just to purchase a new case. But if you’re looking for an original, they can be spotted quite readily even without an axle identifycation tag. The N cases had two vertical ribs, three horizontal ribs, and a machined-in fill plug. There are four versions of the nodular iron third members that were produced from the factory. 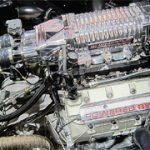 These first became available on the 1964 Galaxies with the 427-ci engine and were found on many higher horsepower cars and trucks. Of the four versions of the N case, three have an actual “N” cast into it right above the pinion cartridge. The fourth version did not have the “N” in the casting on the outside but still retained the rib structure. In order to verify a nodular unit, you need to look on the inside of the casting. These have a C4AW-4025-B casting part number next to the adjuster nut. Of course, if your budget allows, you can purchase an aftermarket iron case that is stronger than any factory case. If you are looking for an N case or think that you have found one of these desirable axles, make certain to examine it closely. The WAR, WAA, and WAB cases have the same ribbing as the N case, but are missing the ever important “N” feature. This chart references the connection between the month codes and the actual month. The letters I and O are skipped to avoid confusion with the numbers one and zero. Any of the W-series cases do have a fill plug machined in them. Both standard and W-series cases are made out of gray cast iron. Only the N-series cases are made out of the stronger, more desirable, nodular iron. While the iron is molten, magnesium is added to increase the shear strength of the alloy. The magnesium addition causes the grain structure to change from flakes to nodules and thus the name “nodular” iron. The N cases typically came with the larger Daytona-style pinion support bearing, and 31-spline axle shafts. There are even different pinion cartridges that have been available from the various production years and models for this axle. The Daytona- style cartridge allows for a larger pinion head bearing when compared to the standard pinion cartridge. This is a great upgrade component to use for high-power applications or if you are replacing your cartridge. 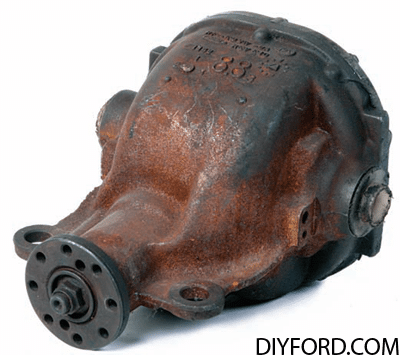 Like most Ford axles, the 9-inch has a single hypoid ring gear mounting distance, so, unlike the Dana and GM axles that require unique differential carriers based on ratio, a single differential carrier works with all of the Ford ratios. Also, since this axle is used in so many circle-track race cars, the 9-inch enjoys an unparalleled availability of different gear ratios in the aftermarket. This case looked like a nodular unit from the front regarding rib structure but did not have the “N” on it. When you look on the inside, you see WAB- 4025A. This is not a nodular unit. The desirable N-style, nodular-iron gear cases are available in four different versions. There are three versions with external Ns cast in; note the more curved style on the top right. The unit on the top left seems to be nodular iron but requires a little more investigation to verify. The axle housings themselves had many different variations over time as well. These variations include different-size drum brakes, disc brakes, and wheel hub arrangements. The aftermarket Daytona-style pinion cartridge accommodates the larger and stronger pinion head bearing. This particular pinion cartridge is well reinforced and much stronger than the stock production cartridge. Here are the internal sides of the same three units. Now you can see the C4AW-4025-B part number on the lower left unit, which verifies it as a nodular unit. Since these housings were a series of stamped-steel pieces all welded together, there were many different overall lengths, tubes sections, mounting brackets, and even general constructions over the years (see Chapter 5). 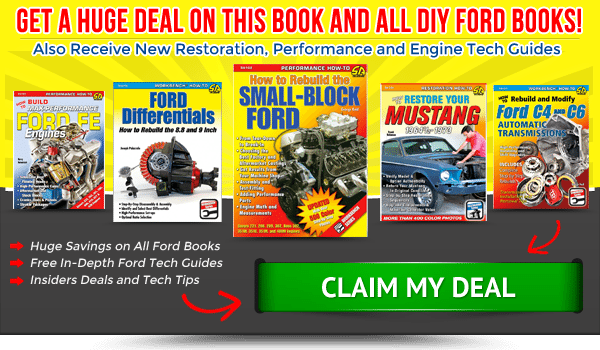 The Ford 8.8-inch is very similar to the General Motors (GM) 87⁄8-inch, 12-bolt axle. Some differential experts tell you that the Blue Oval engineers copied the 12-bolt design when they came up with the 8.8-inch axle. While the 8.8 is similar to the 12-bolt, it isn’t identical. Interestingly, the Ford axle uses the exact same size of tapered roller bearings as the GM 12-bolt. The Ford version uses larger axle shafts and different lube flow strategy. These axles did have metal axle tags similar to the 9-inch axles but they were slowly phased out as vehicle programs were updated. There are several reasons for this. Cost and complexity are two. These tags provided information for the service technicians but wasn’t that important for the vehicle assembly plants. The third reason was basic health and safety concerns for the assembly technicians and other employees who handled the axles in the manufacturing and assembly plants. There were many instances of cuts and scratches from the thin steel tags sticking up on the axles. 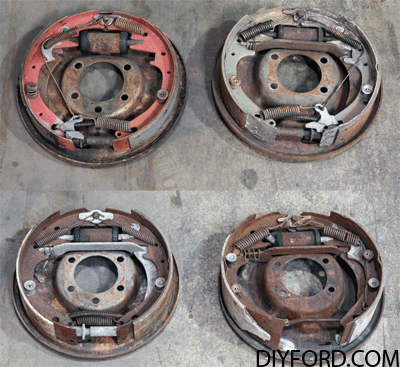 This is an example of the brakes that fi t the small wheel end bearing for a 10 x 2-inch-wide drum brake on the left and a 10 x 1¾-inch on the right. 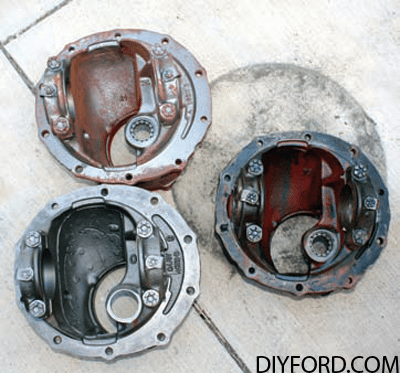 Here is an example of 11 x 2¼-inch drums brakes with the small bearing size on the left and the large Torino style on the right. The large bearing size was available with fi ve different brake drum widths. Four of the 11 inch-diameter versions are pictured: 1¾ inches (top left), 2¼ inches (top right), 2½ inches (bottom left), and 3 inches (bottom right). A 2-inch version is not shown. 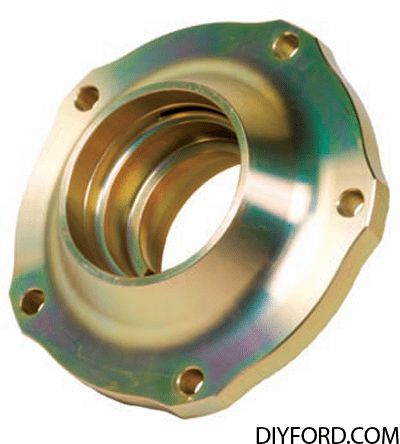 Along with the many different brake and wheel end varieties, many different styles of axle shaft ends were manufactured. Some have only one access hole for the backing plate bolts, while others have three. Most have the two driving holes for the manufacturing process while one has a more square looking drive end. None of which changes the strength of the axle shaft. There are even different drum brake registers. 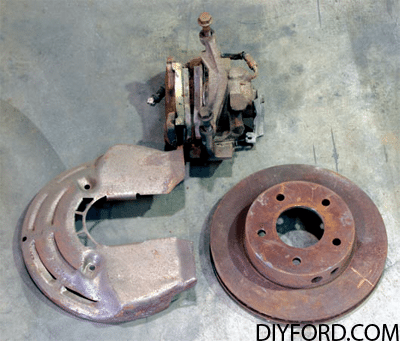 The Lincoln Continental style of disc brakes use 11½-inch rotors. In the 1980s and 1990s, the Lincoln Versailles brakes and complete axles were highly sought after because it was the only way to get a 9-inch axle with discs in a 58-inchwide axle package. At this width, many were used in street rod applications without modifi cation. 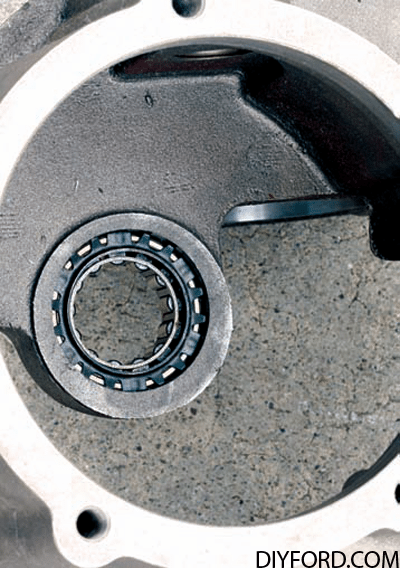 With so many better performing aftermarket options today, there is no reason to use these marginal brakes. Some axle shafts can be shortened and a new spline machined in place. The 28-tooth axle shafts are typically tapered and cannot be shortened. Most 1972 and earlier 31-tooth spline shafts can be shortened and 1973 and later versions typically cannot be resplined. Here is a picture of the milling machine cutting new spline teeth after the axle has been cut to length. This is an example of the only Ford 9-inch version that utilized one-piece tubes. Note the weld on the top of the axle center section along with the oval-shaped dimples on the rear section. The tubes do not have any welds, and you just see the witness marks of the parting line for the dies on the tubes. This was offered on the 1960 F-100 truck. Besides the styling of the Ford Edsel, even the axle shafts were very unusual. These shafts had a longer brake spacing offset and a unique brake drum register diameter of 2.870 inches, which was uncommon for the time. (It was later used for pick-ups and Broncos.) These axles even have a unique bolt pattern of five on 5 inches. I guess this helps add to the splendor of the vehicle. The Mustang Shelby GT housing is an easy one to spot, albeit rare, because it has extreme tapering of the axle tubes at the ends. There was a desire to have the stronger, larger tubes near the center of the axle but still retain the narrower tube ends for the wheel ends and the unique Shelby suspension brackets. From my piles of rare parts, here is an independent cast-iron 8.8-inch carrier axle. Note the ring diameter cast into the housing above the pinion. The Lincoln LS and Jaguar S-type were equipped with an 8-inch, castaluminum, independent- style carrier. Notice the 8.0-inch ring gear diameter cast into the rear cover below the fill plug. Also notice the part number and metal axle tag. The bar code is present on this unit as well, although later axles just carry the bar code and the metal tag is no longer required. Ironically, 8.0-inch independent carriers were made in cast iron. Here is an example of such a unit. The Ford Explorer uses an independentstyle Carrier made out of cast aluminum. The ring gear speed sensor is shown in the upper right-hand portion of the photograph. This sensor is for the anti-lock brake system. The tags were replaced with adhesive labels that are placed around the axle tube near the brake and wheel end. These labels have a specific code that is similar to the axle code on the 9-inch axles. 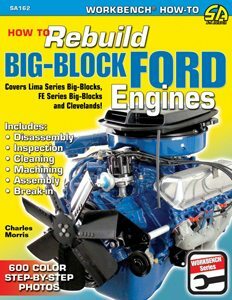 The Ford 8.8-inch axle has the same ring gear mounting distance (see Chapter 7) for all ratios, just like the 9-inch. 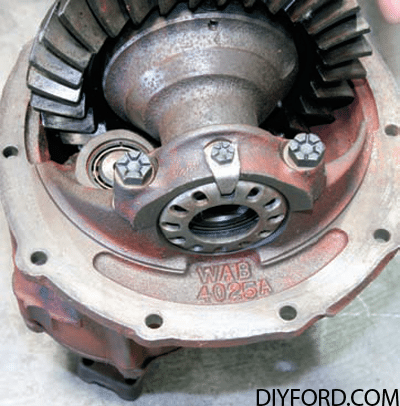 So again, unlike the GM and Dana axles that require a unique differential with different ratios, the Ford 8.8-inch differential is common across all of the ring-and-pinion ratios. There is a ton of aftermarket support for this axle (see Chapters 3 and 4 for more details). The 8.8 is a traditional semi-fl oat Salisbury axle with C-washers for axle retention. Many people prefer to just call it the Ford 9-inch-style wheel end. But to be correct, it is a 3/4 fl oat. There are 8.5-inch gears installed in these housings for lowerpower vehicle applications. The typical 3 inch-diameter tubes can be a bit flimsy in higher-power applications. The 8.5- and 8.8-inch gears have even found themselves in the independent-carrier-style axles. The Ford Mustang and Thunderbird used this style for a few model years. There were also 8-inch ring gear independent carriers in production.